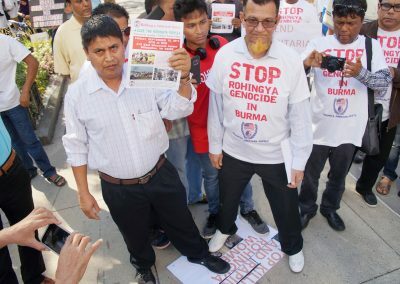 Archbishop Desmond Tutu criticizing Mynamar leader and Nobel Peace Prize winner, Aung San Suu Kyi as she callously ignores the ethnic cleansing of Rohinga Muslims by Buddhists and the military of Myanmar (Burma). 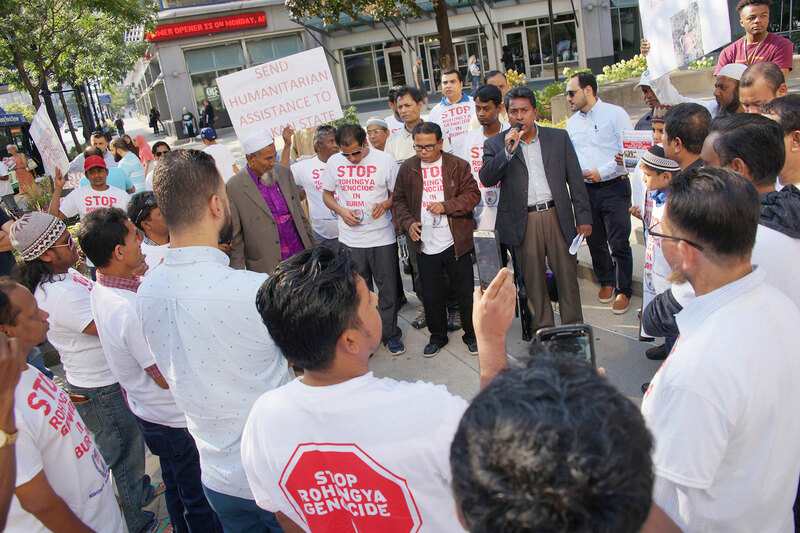 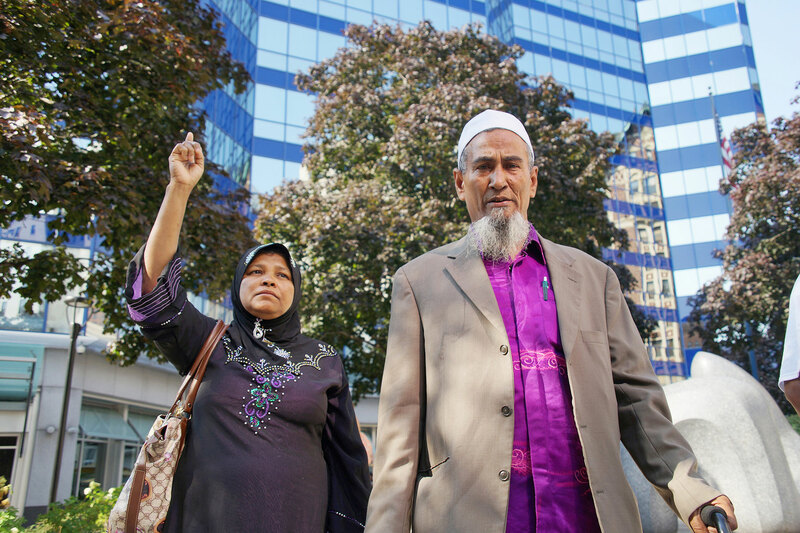 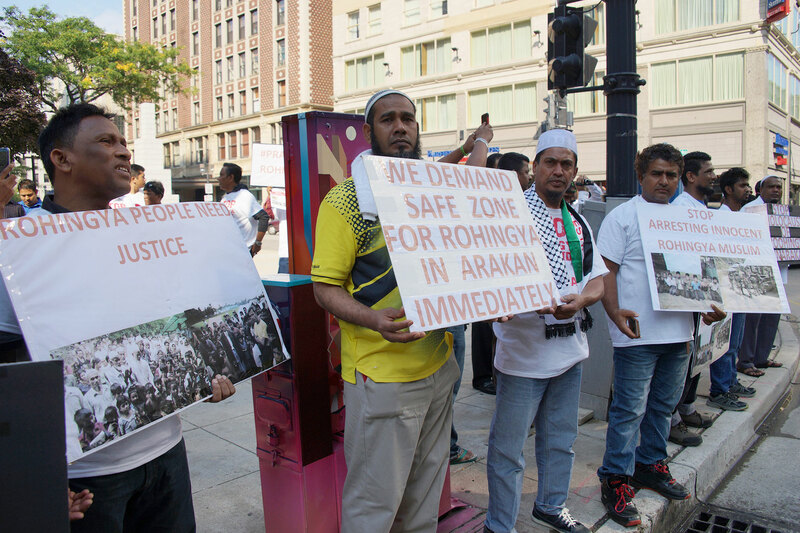 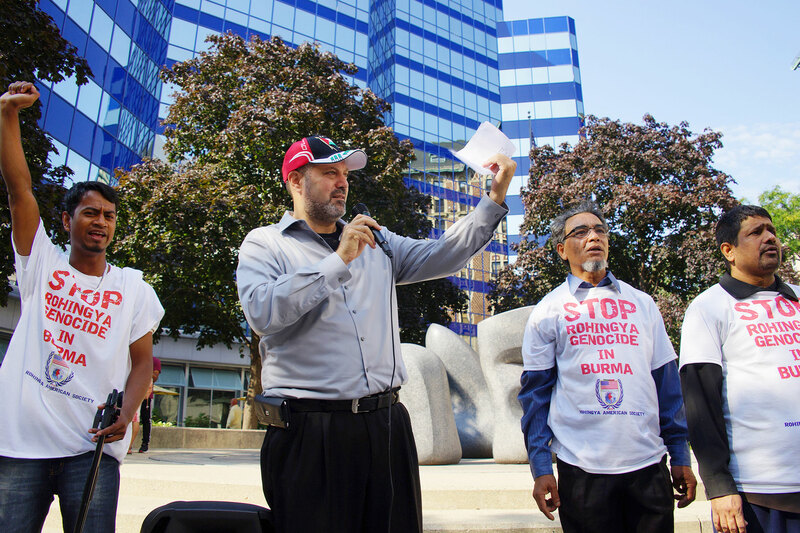 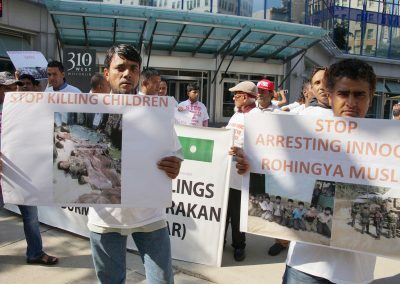 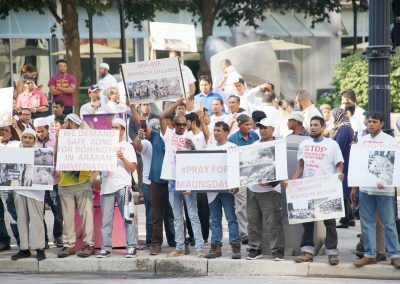 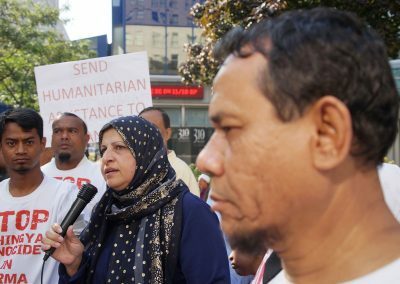 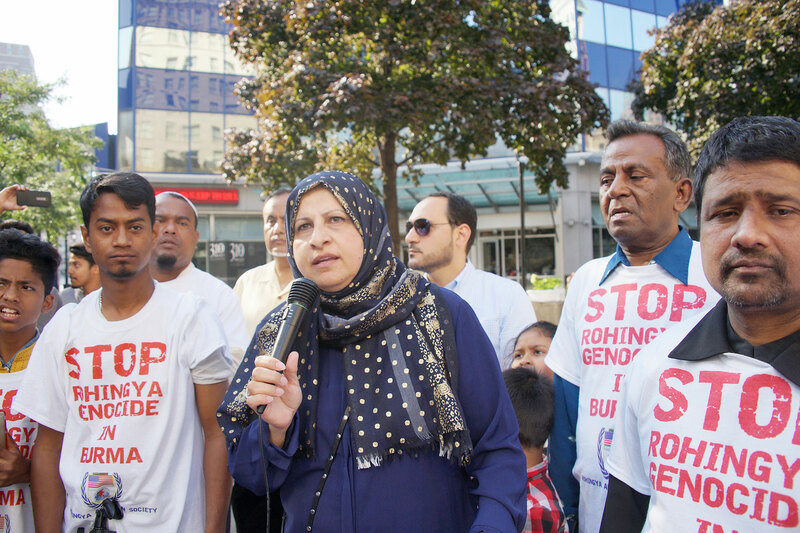 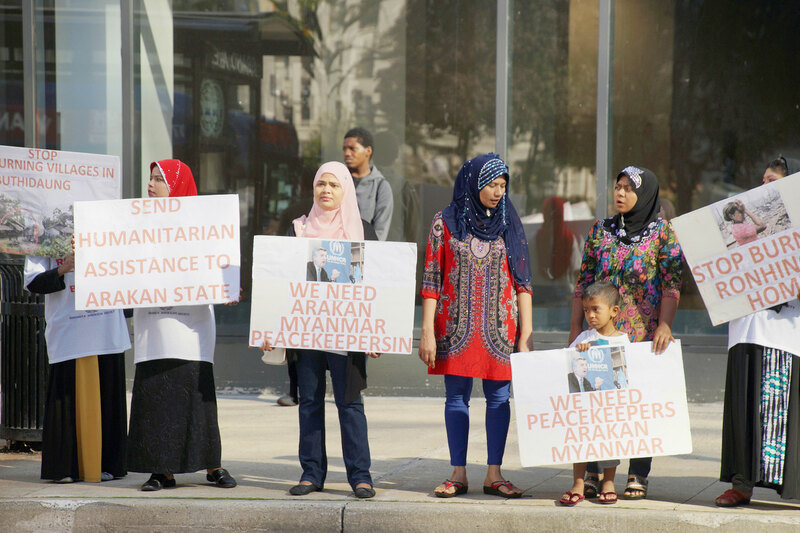 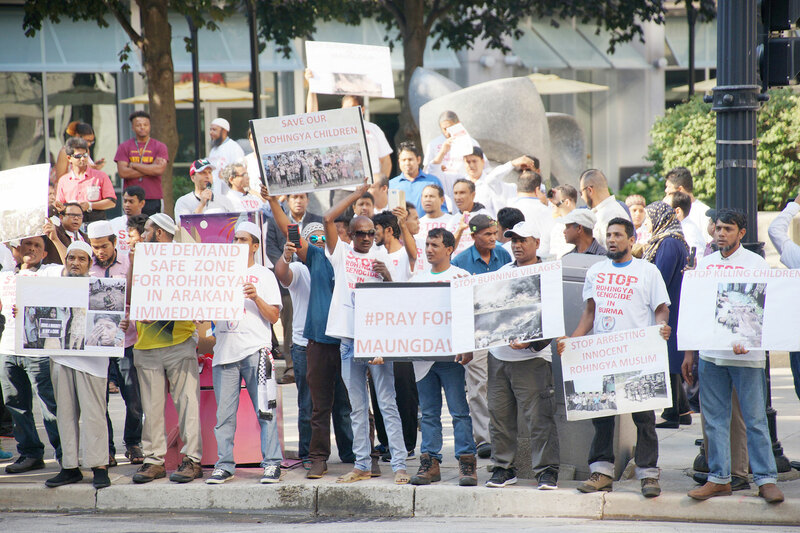 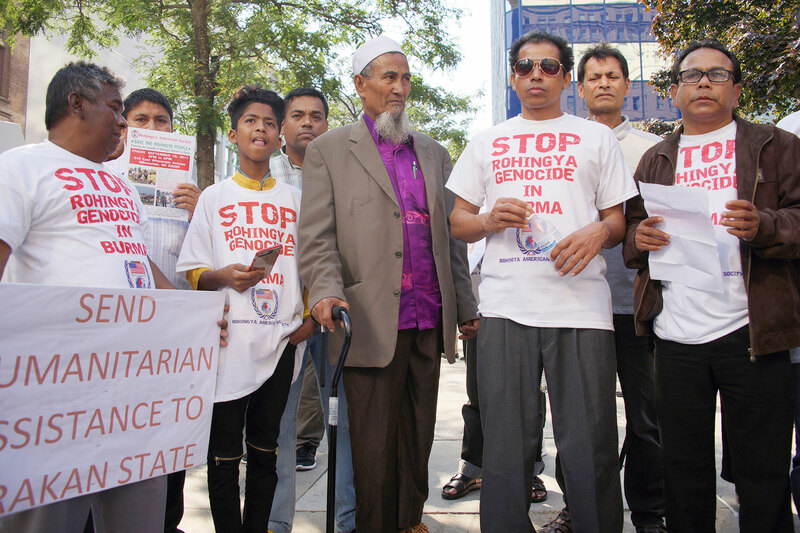 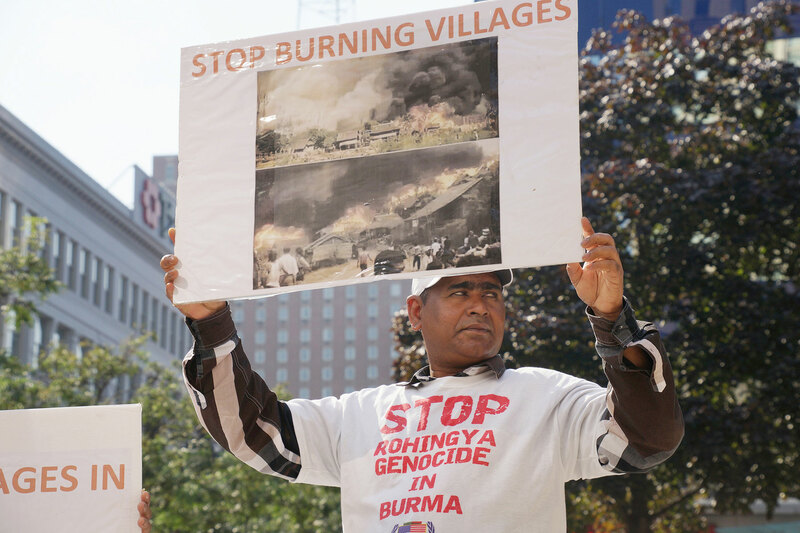 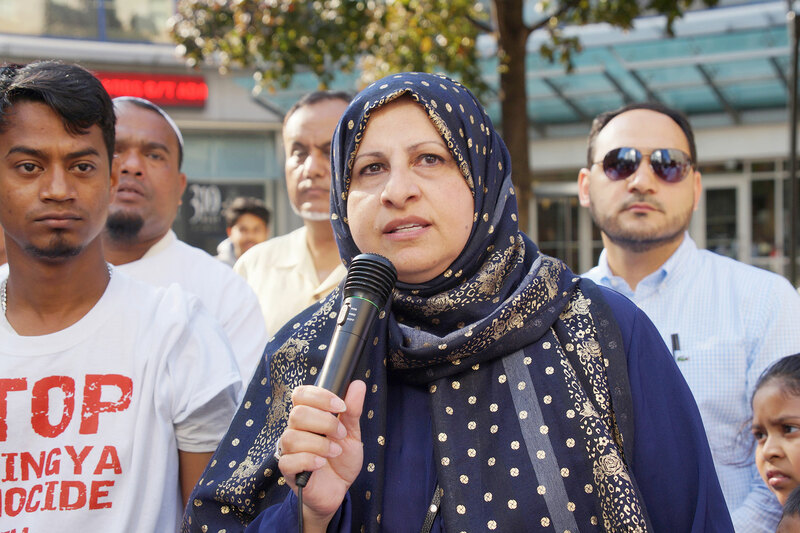 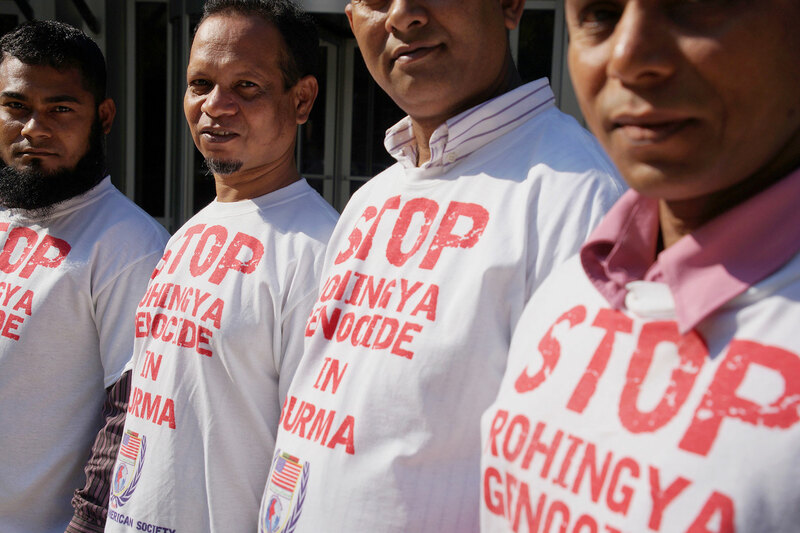 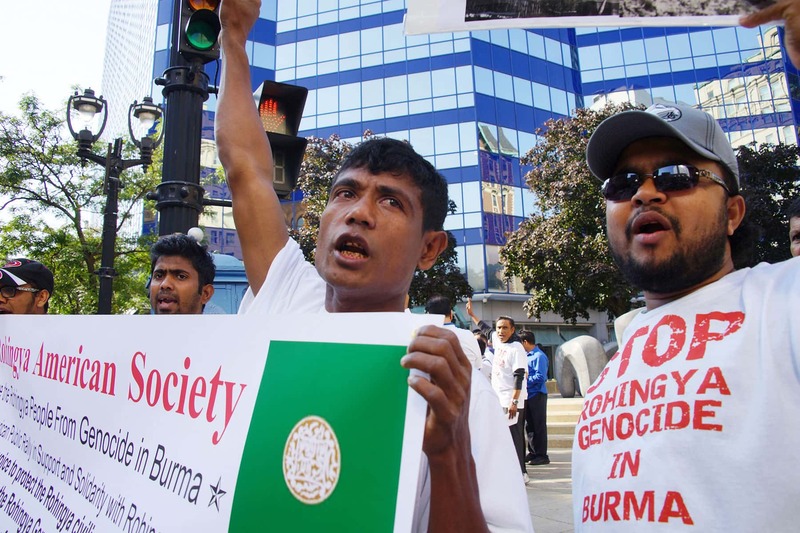 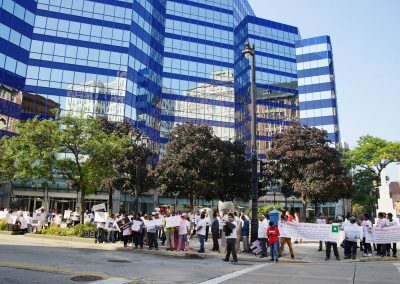 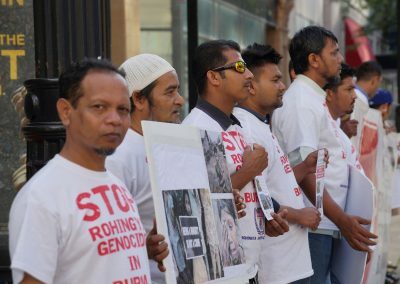 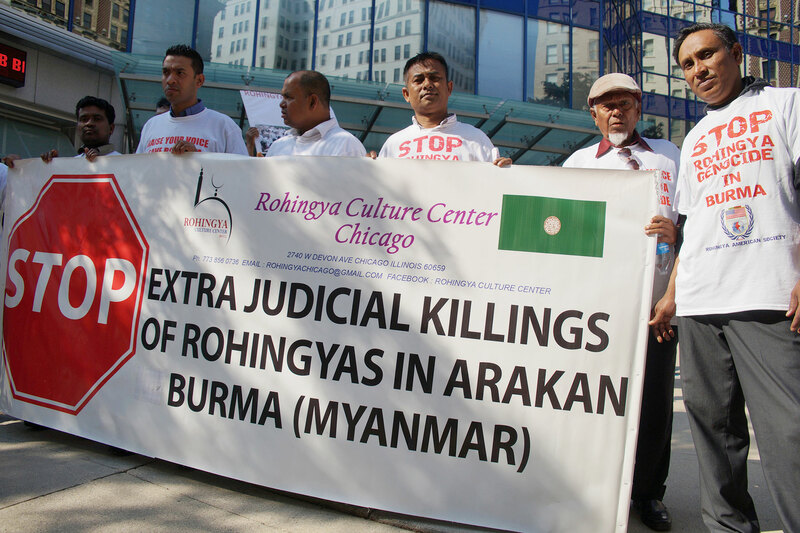 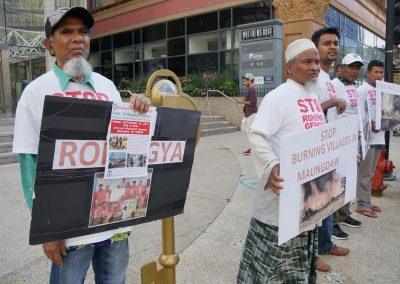 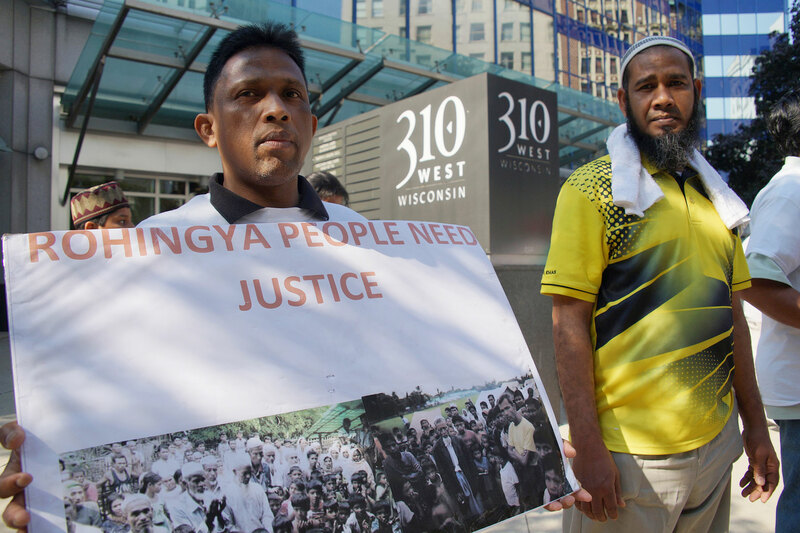 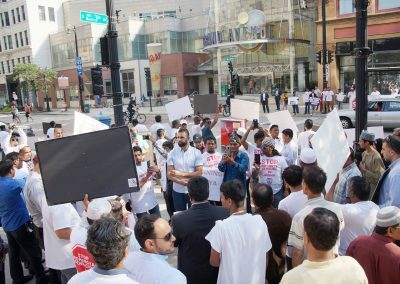 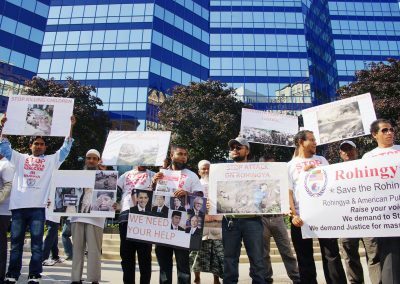 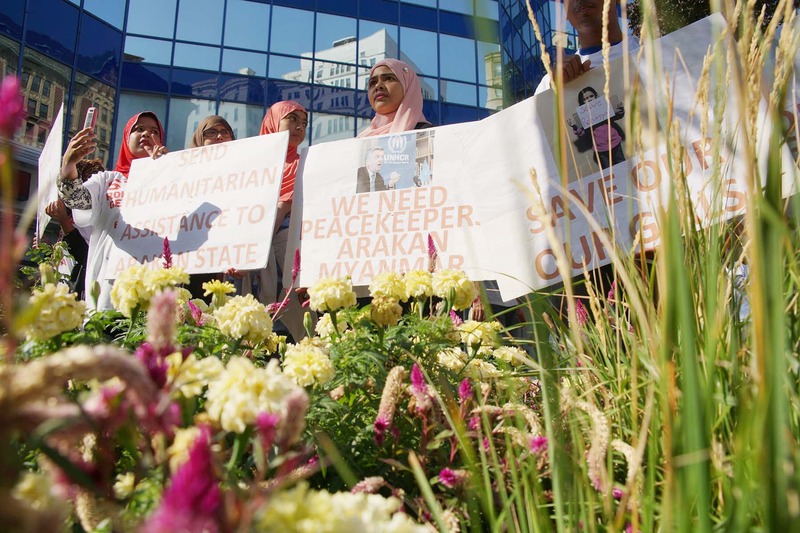 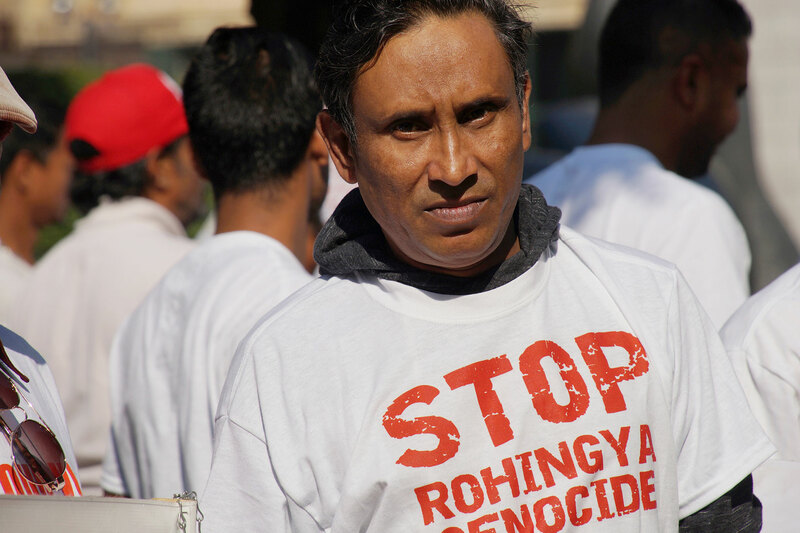 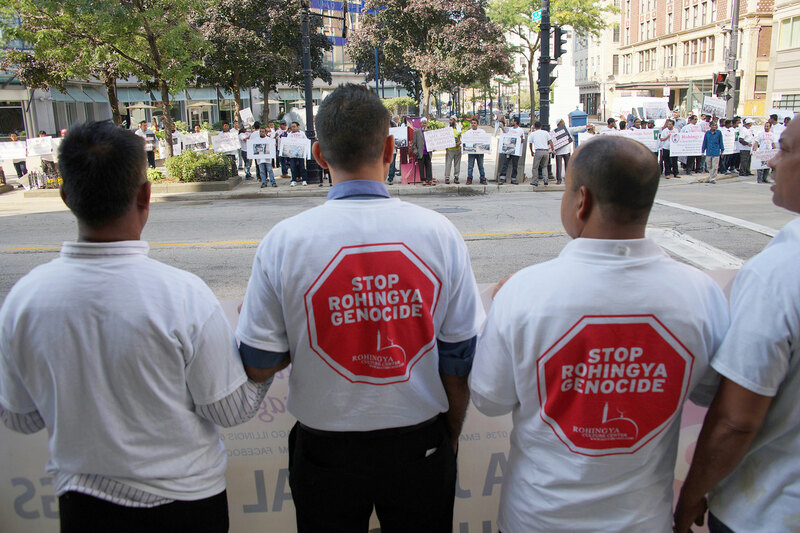 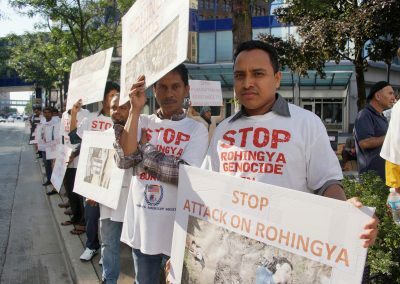 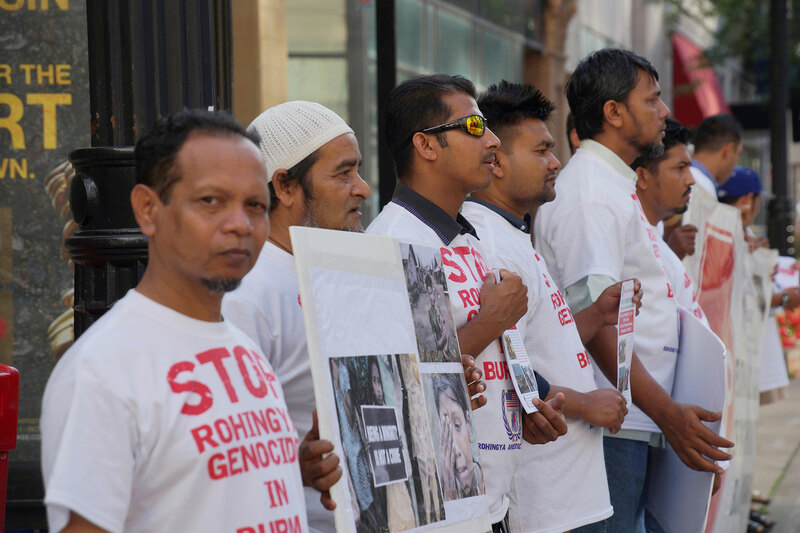 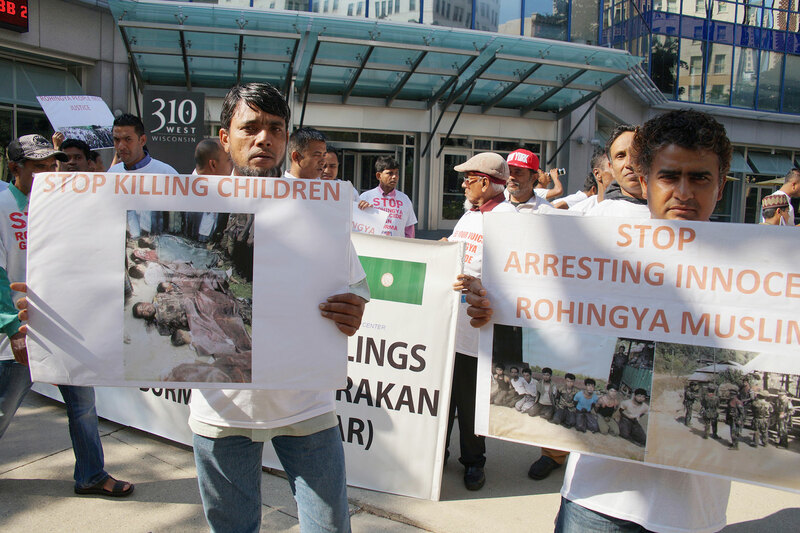 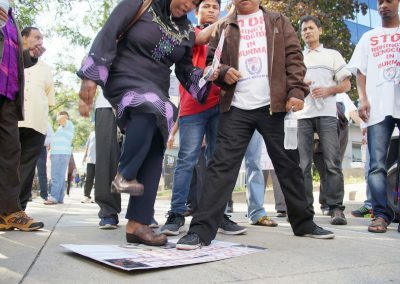 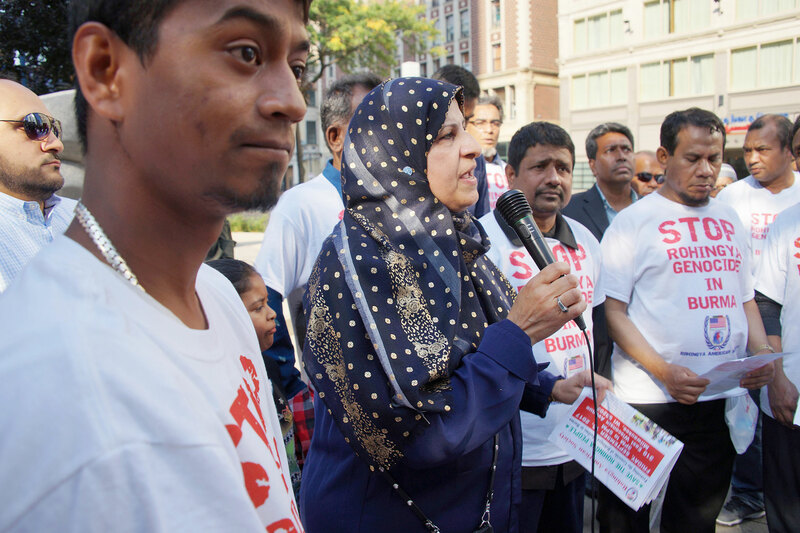 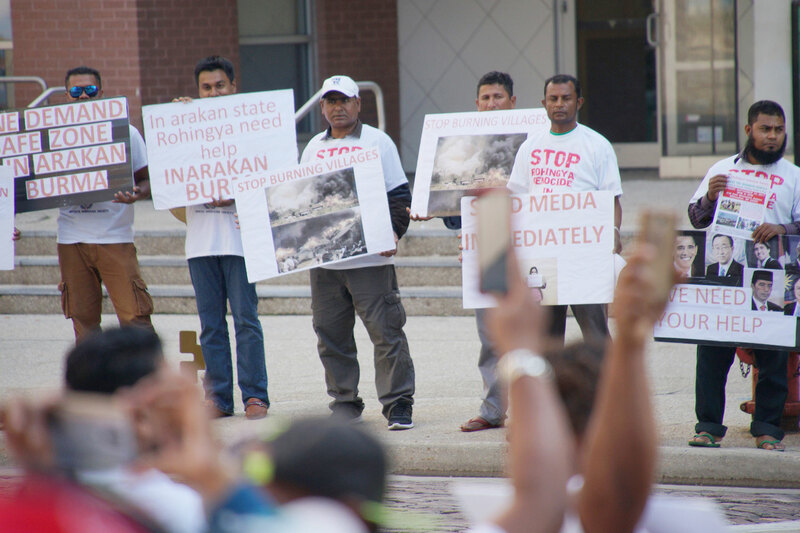 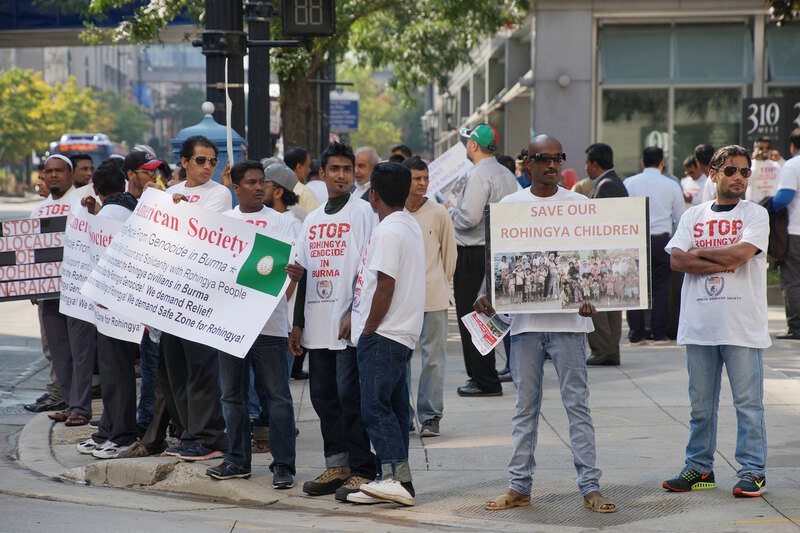 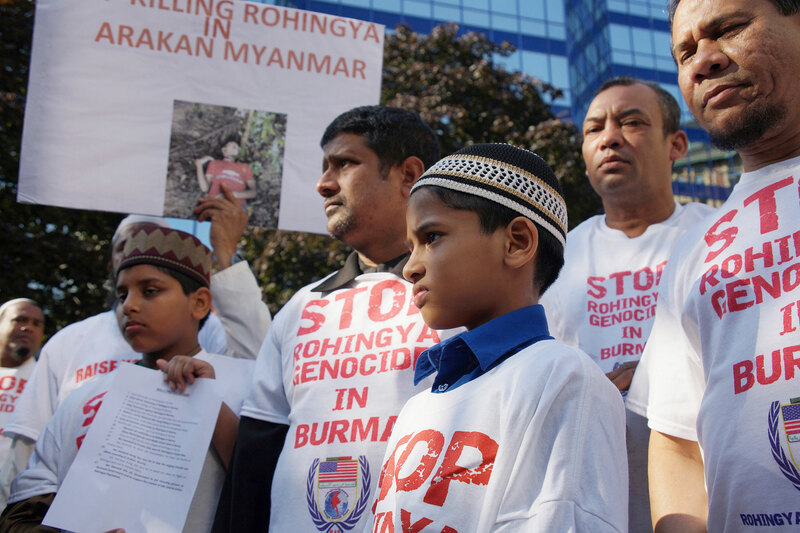 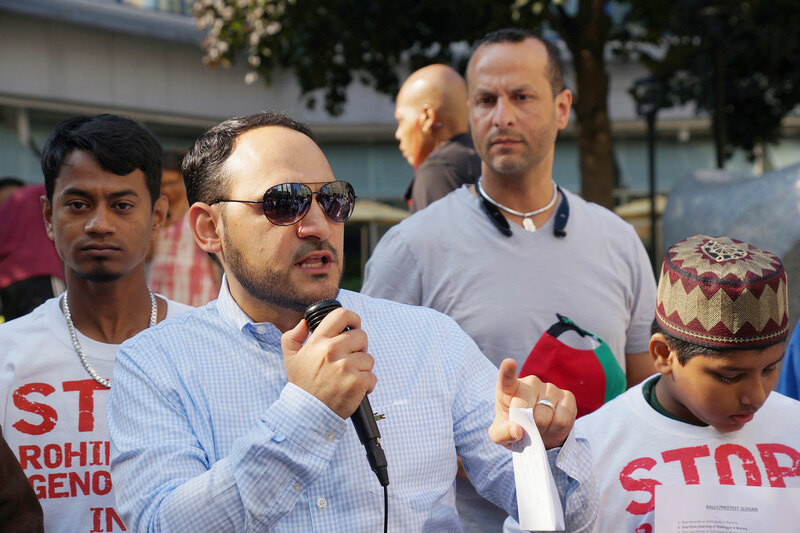 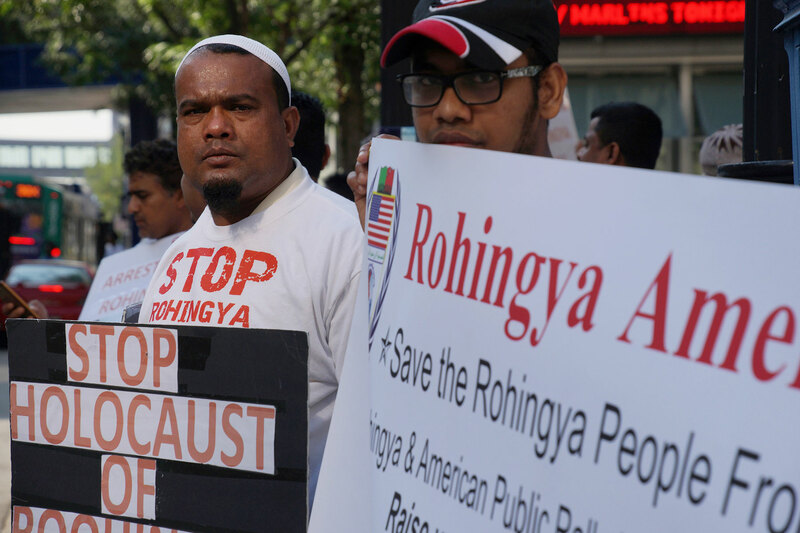 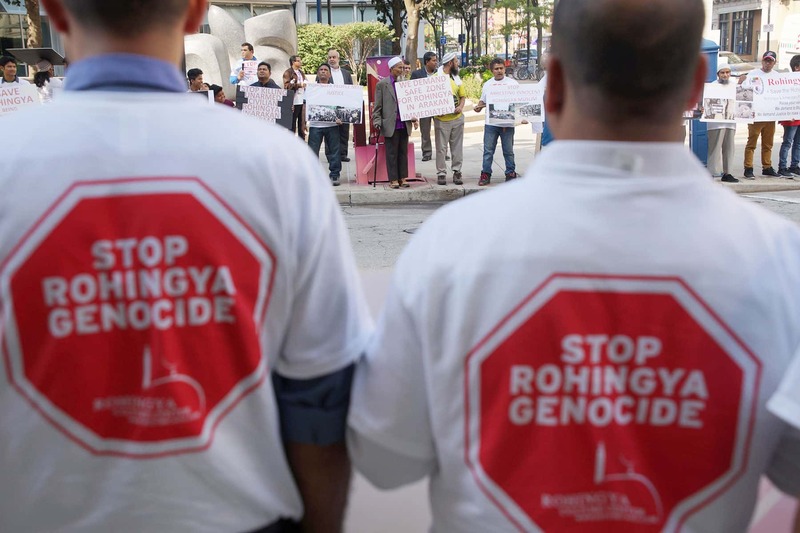 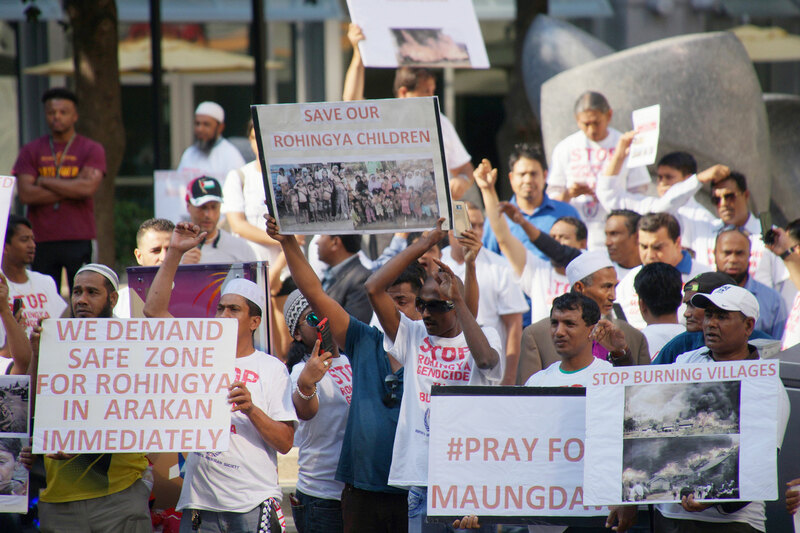 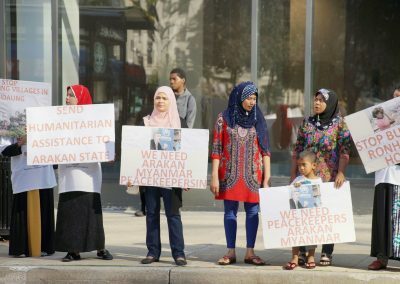 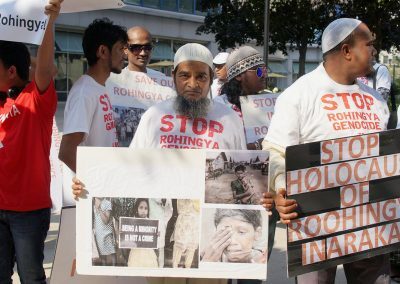 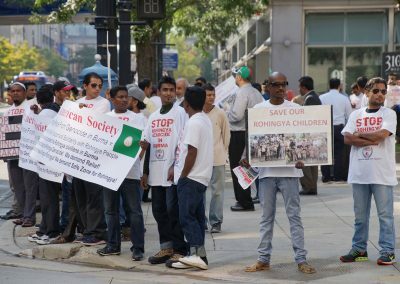 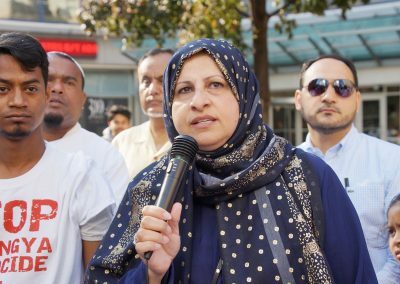 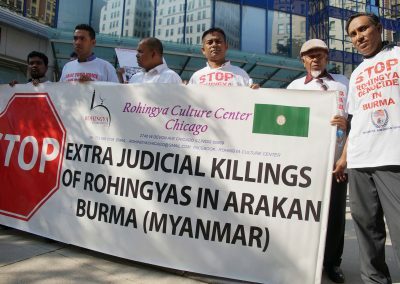 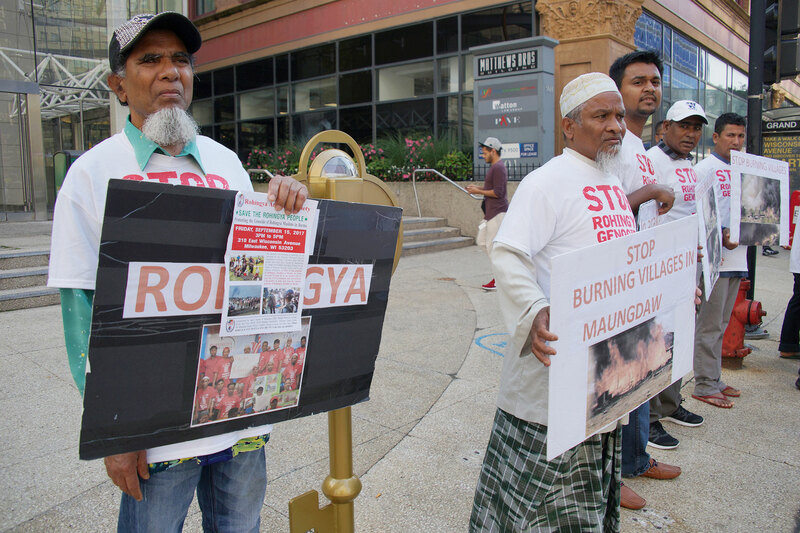 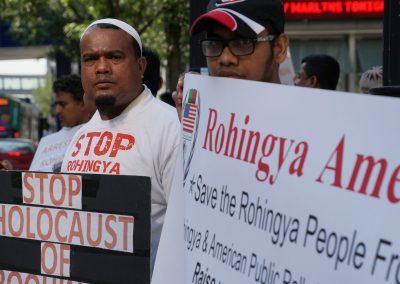 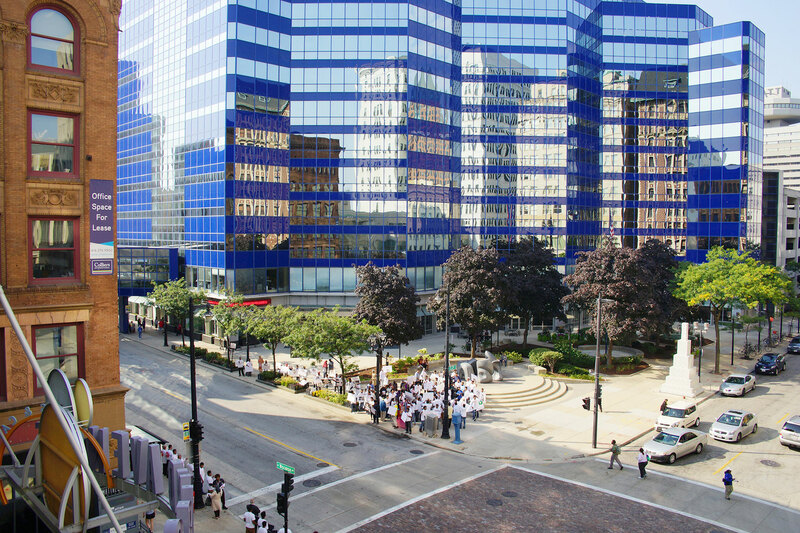 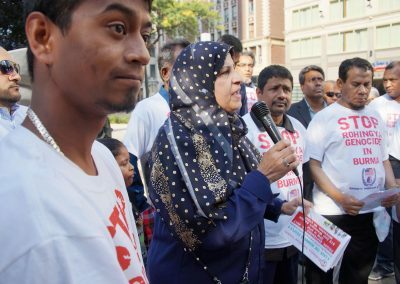 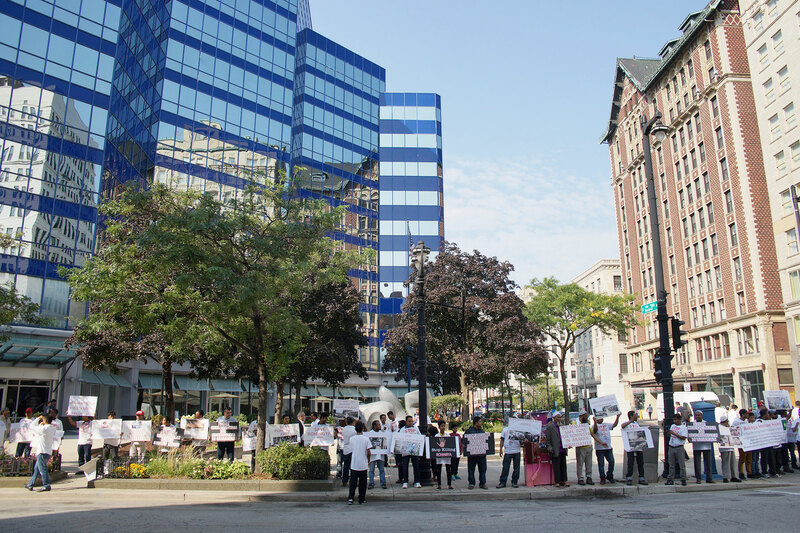 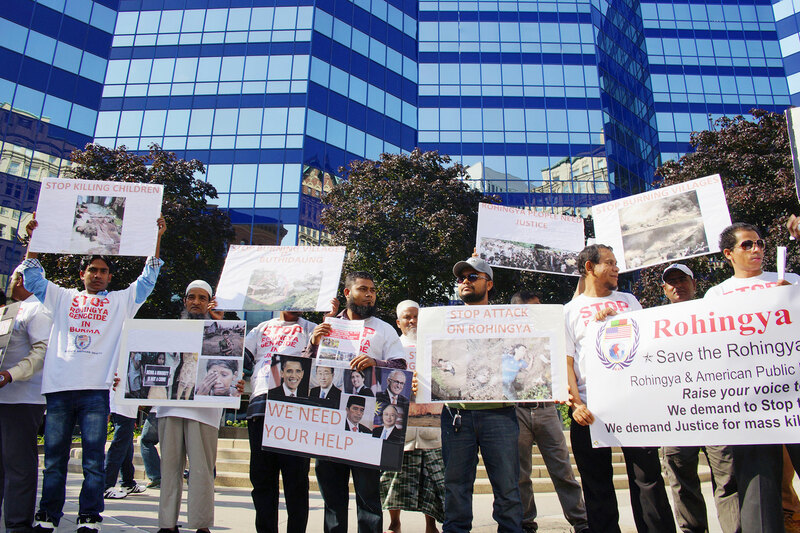 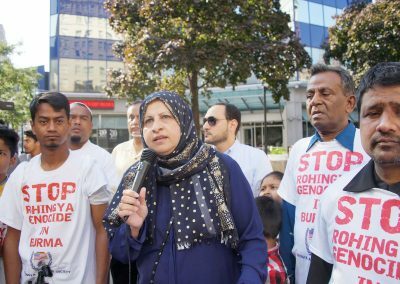 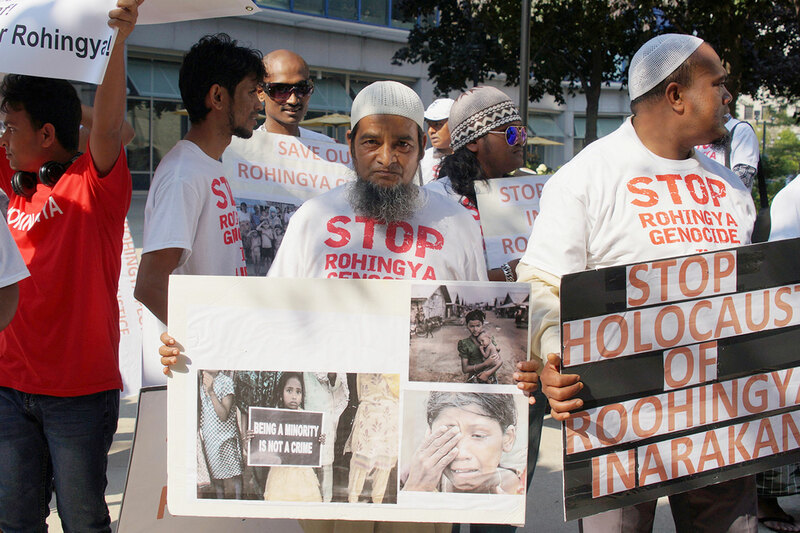 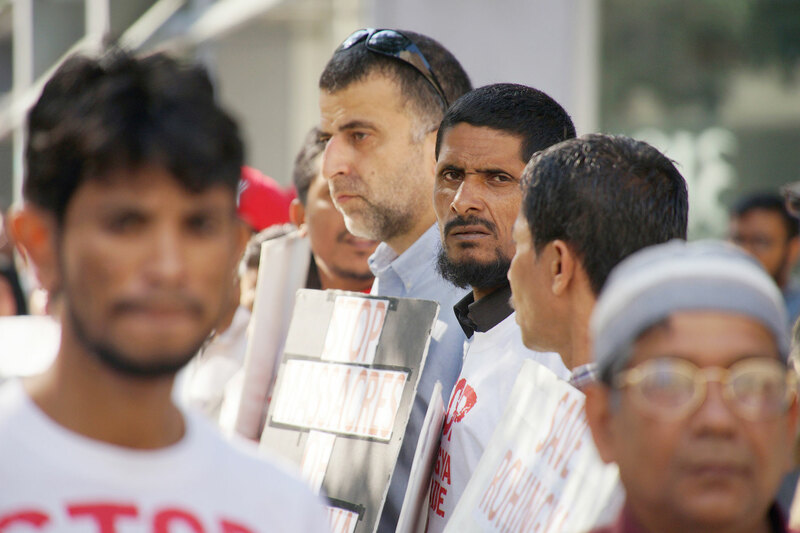 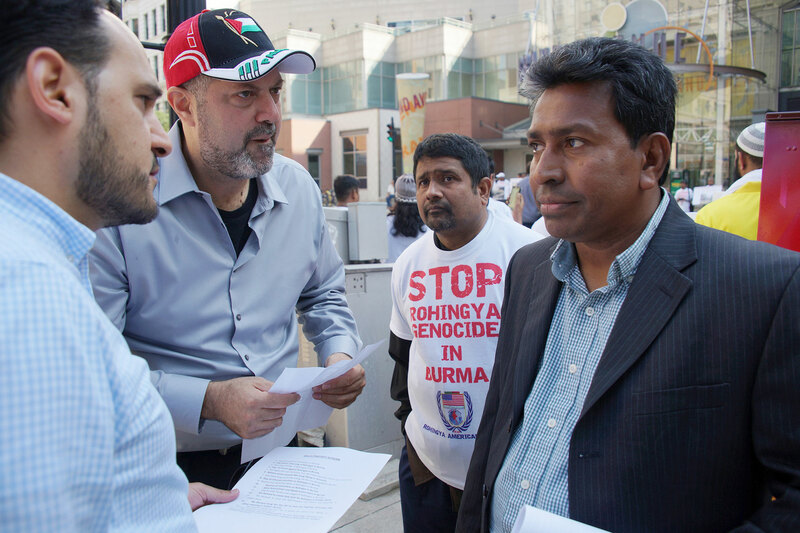 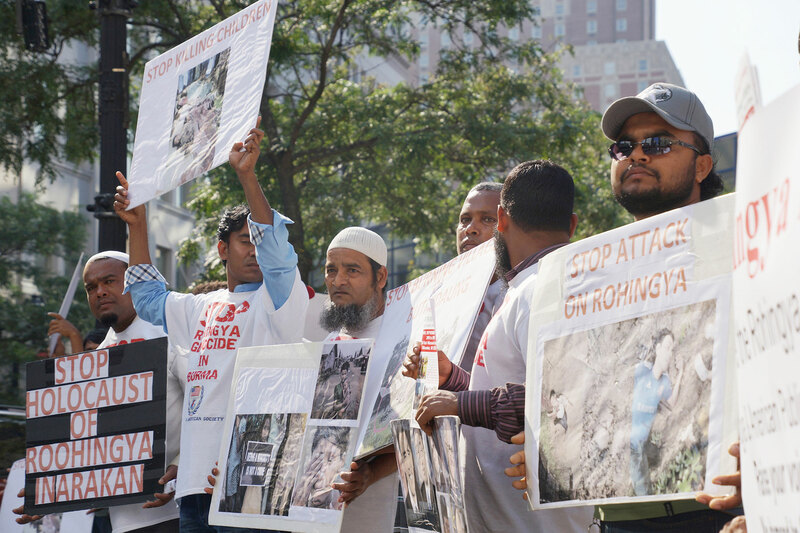 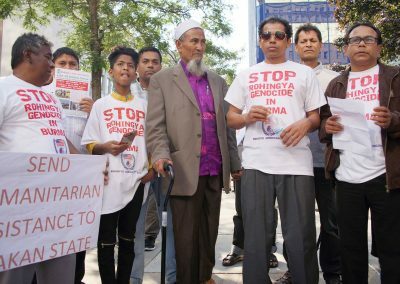 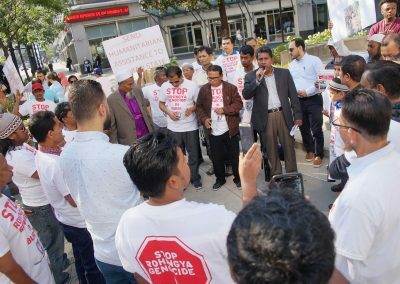 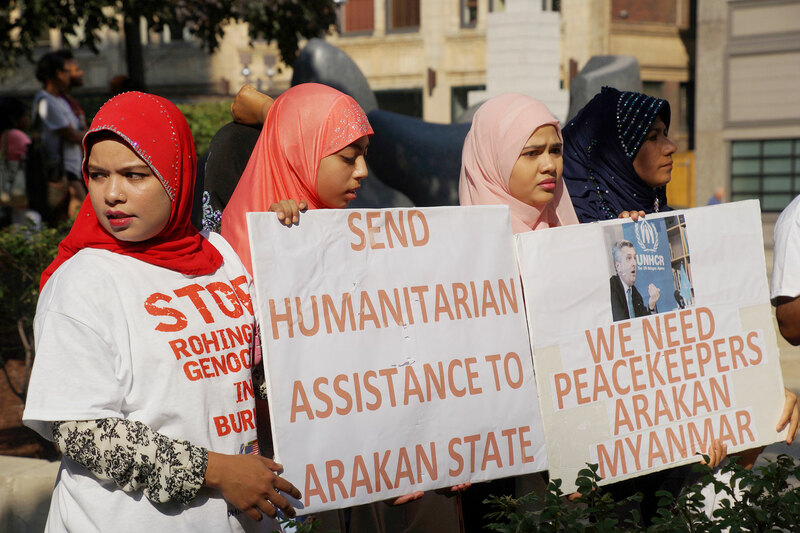 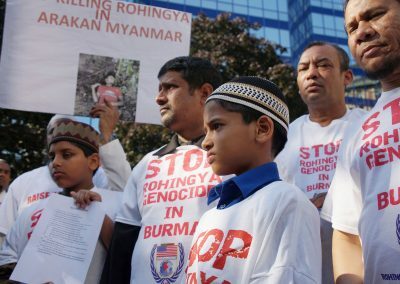 On September 15, more than 150 protesters, mainly Rohingya refugees, lined the street on 3rd and Wisconsin Avenue to urge elected officials to help put an end to the Genocide of Rohingya Muslims, also known as Burmese. 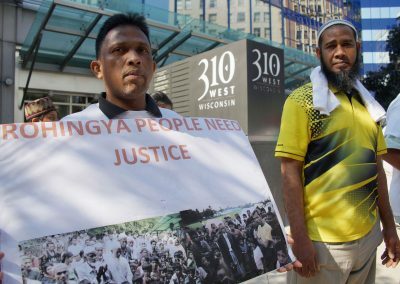 Refugees from Burma are the largest refugee group in Wisconsin, with a total of 5,265 as of 2016. 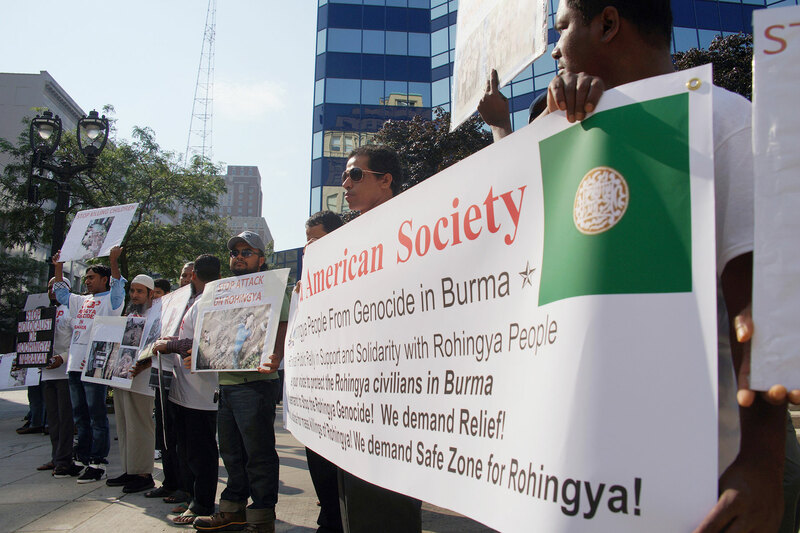 That total is 7 percent of the 73,000 in the United States. Deeply troubling images of entire villages being burned to the ground, and hundreds of civilians being rounded up at one time and kiIIed in the most barbaric manner have been broadcast around the world, often times by the Rakhine Buddhists or the Burmese military in order to terrorize other Rohingya into fleeing the country. 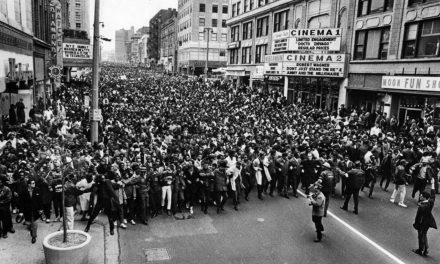 It was these same images that brought the protesters to the street downtown, and it was these images that they had on their signs and banners. 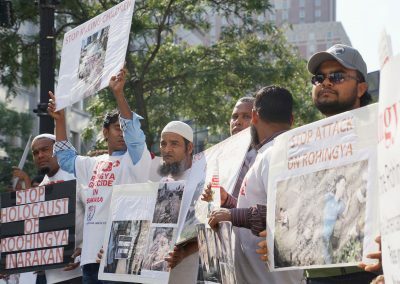 Within one week, over 300,000 traumatized and starving Rohingyas fled to neighboring Bangladesh, a desperately poor country that cannot absorb them. 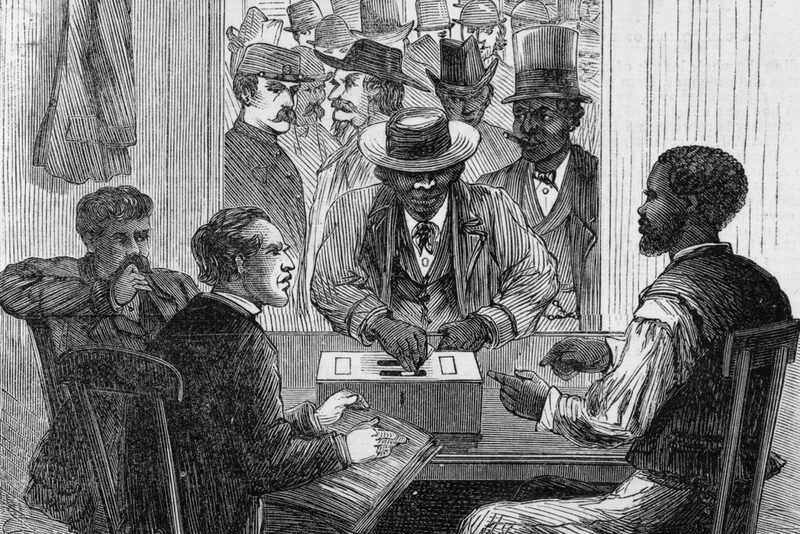 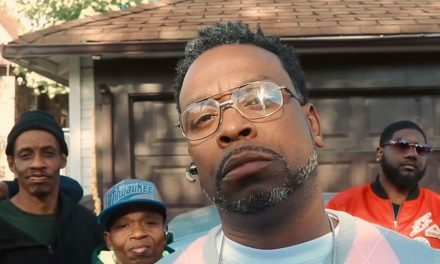 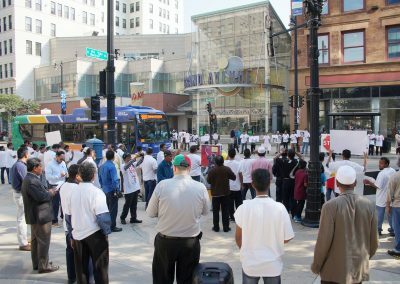 Many of the protesters in Milwaukee were fearful for family members and unsure what became of them. 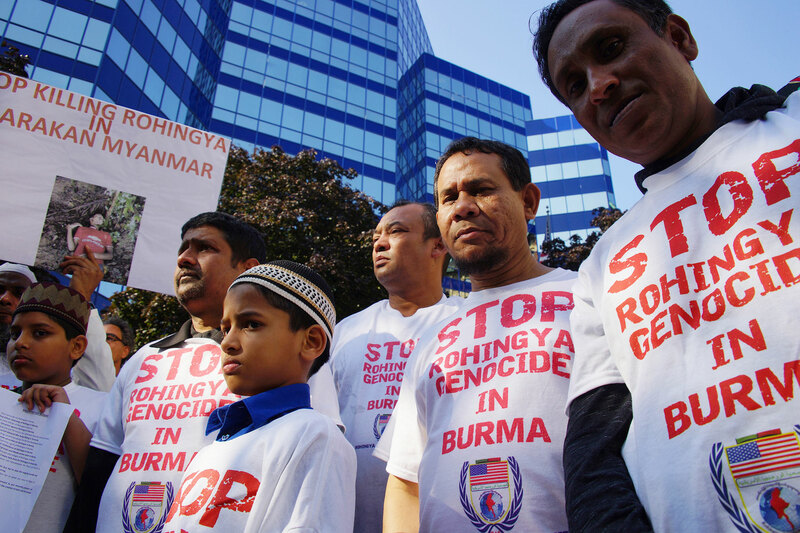 The Myanmar government has blocked food, water, and medicine to 400,000 Rohingyas that are now internally displaced. 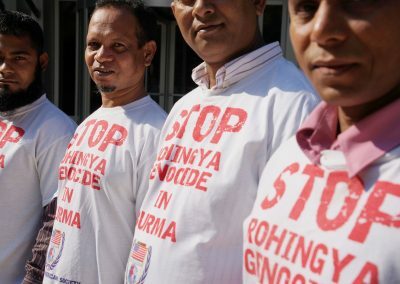 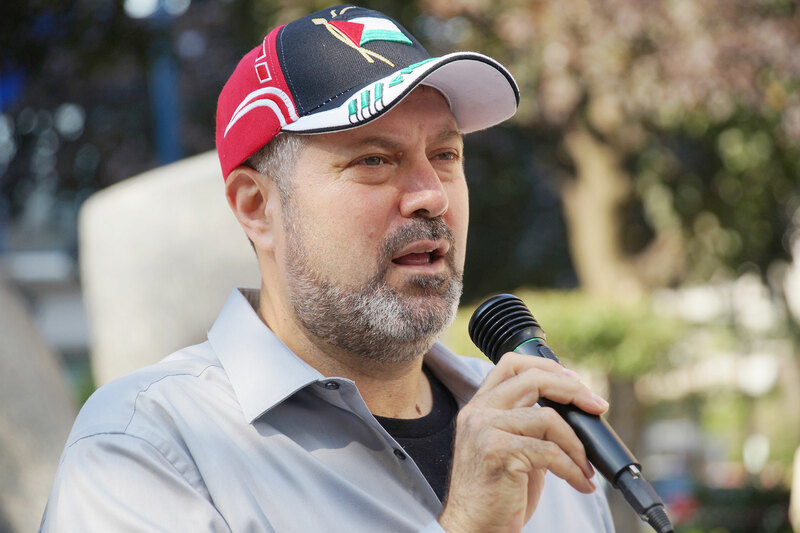 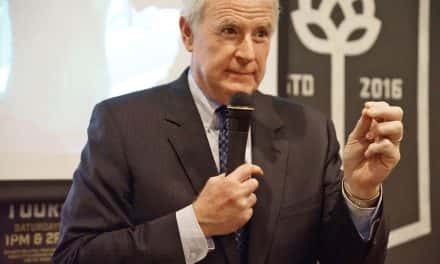 They have also refused to allow the United Nations or any humanitarian organizations access. 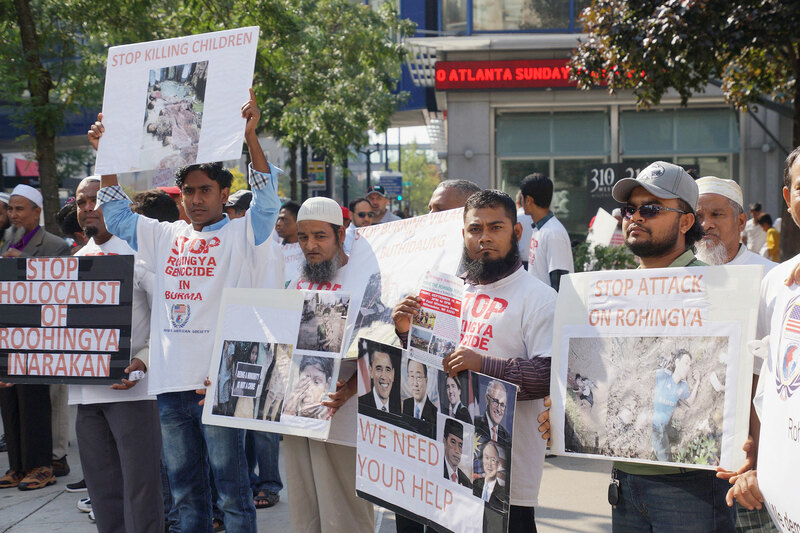 Implement Kofi Annan’s report to restore citizenship rights to the Rohingyas. 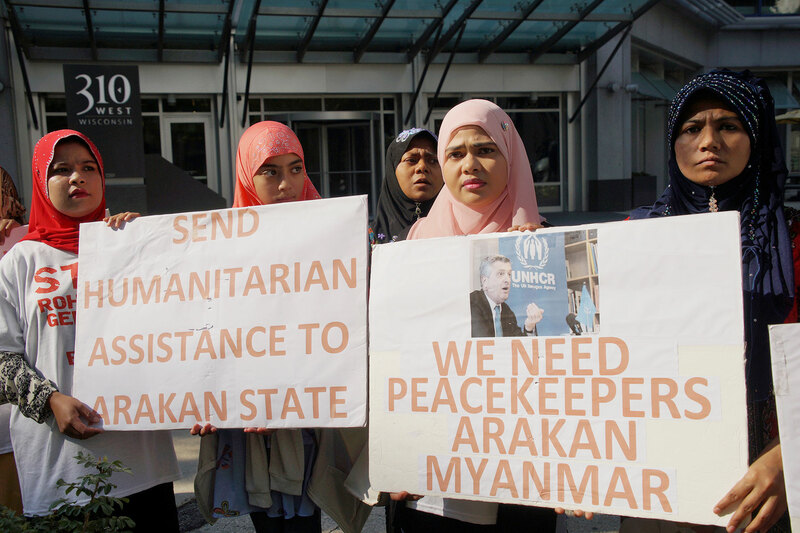 Allow UN Peace Keepers to enter the country. 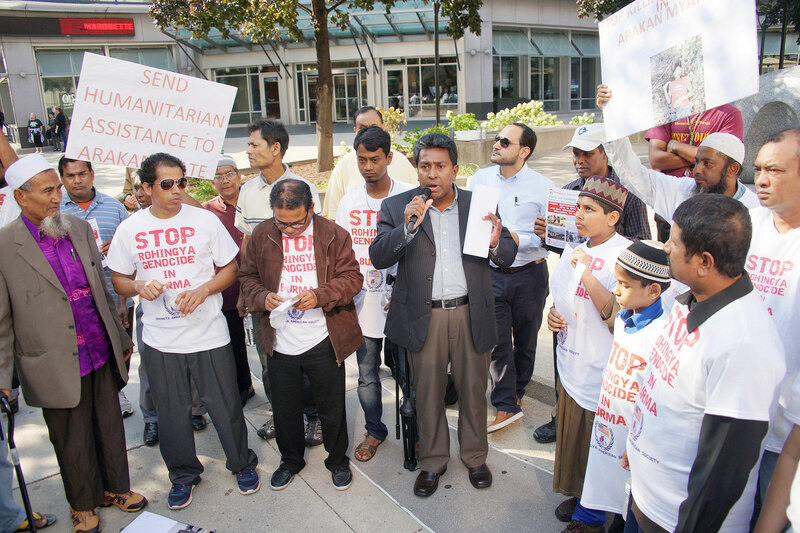 Allow UN aid and Humanitarian organizations to supply food, water and medicine. 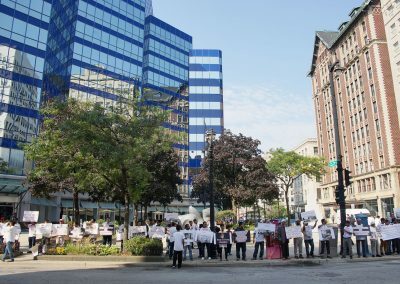 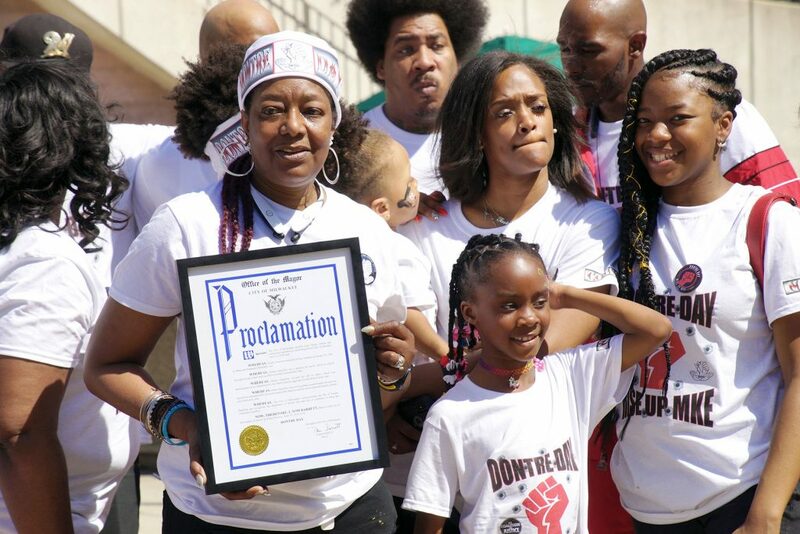 For many of the protesters on Wisconsin Avenue on September 15, it was the first time they have had the opportunity to organize and participate in a rally. 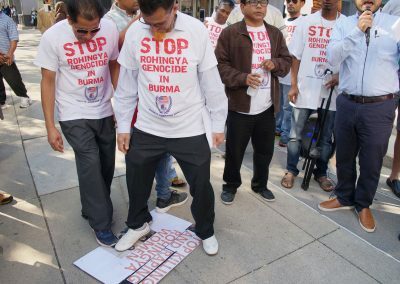 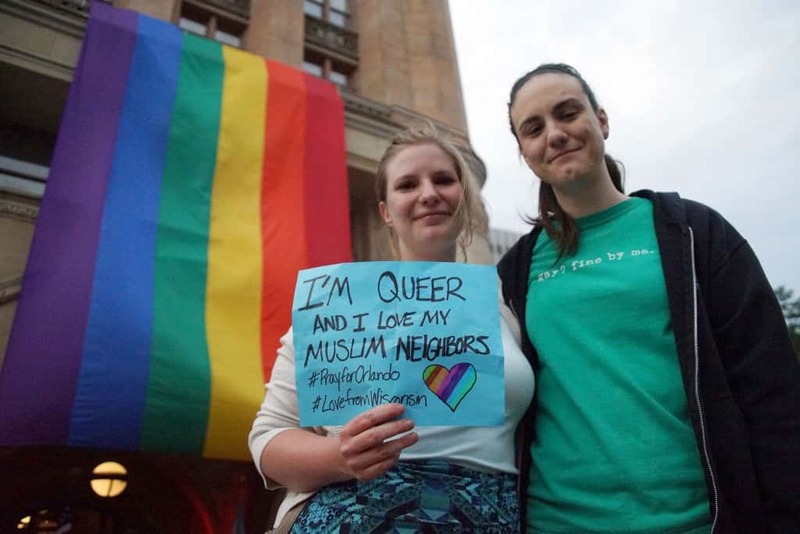 A public demonstration of this type in Myanmar would have lead to imprisonment, or even death. 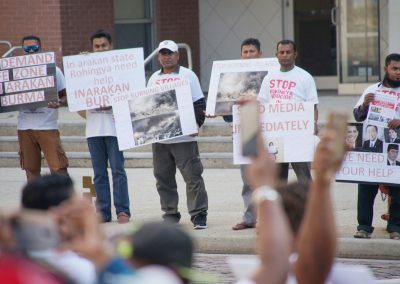 Dozens were recording every moment of the experience on their cell phones. 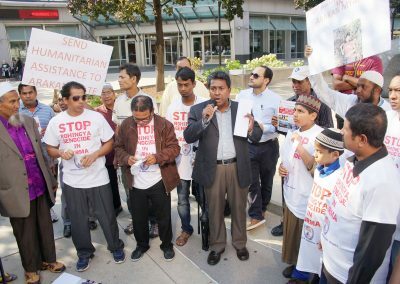 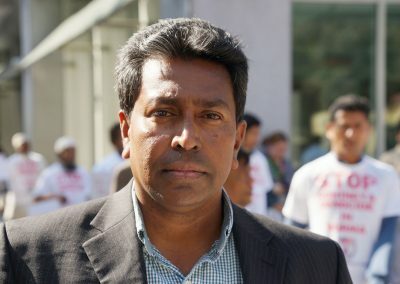 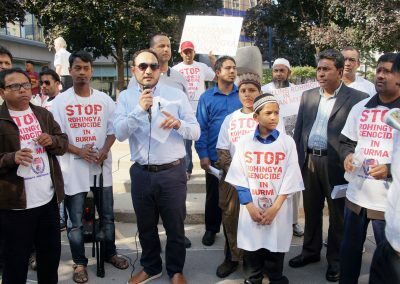 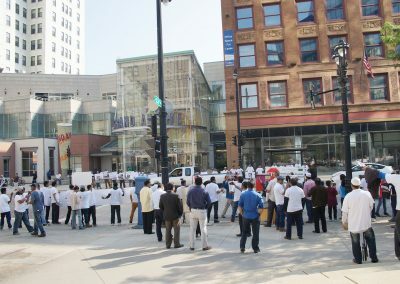 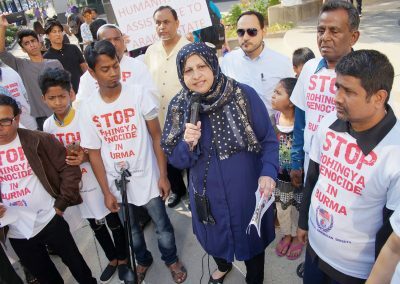 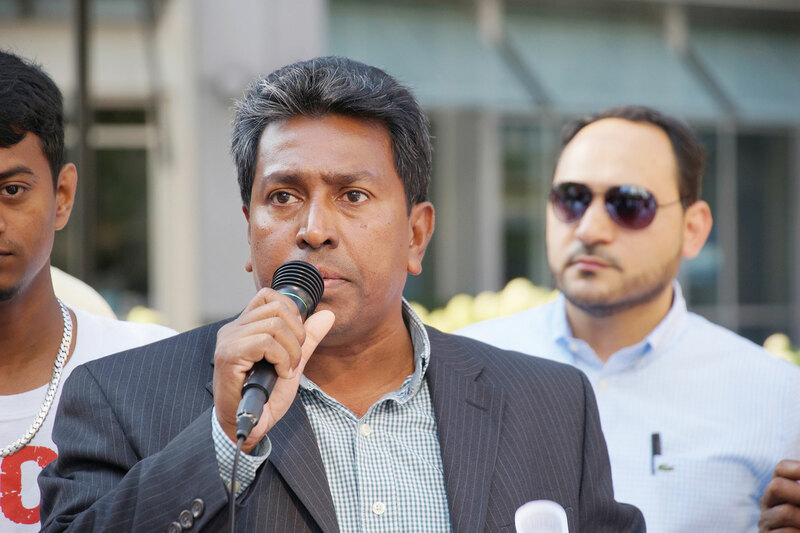 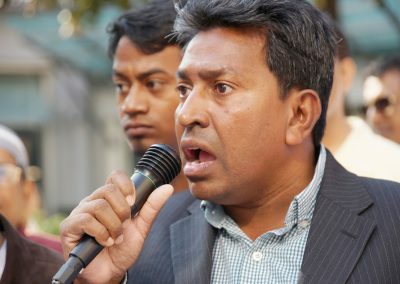 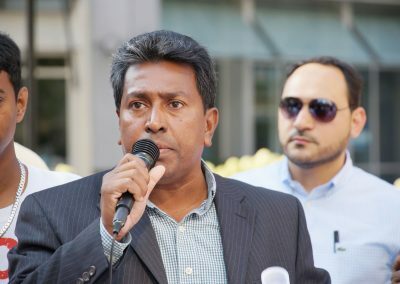 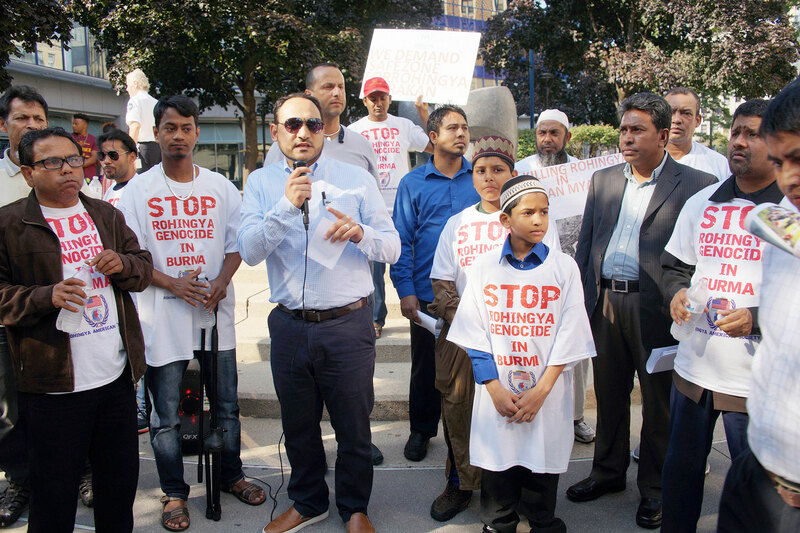 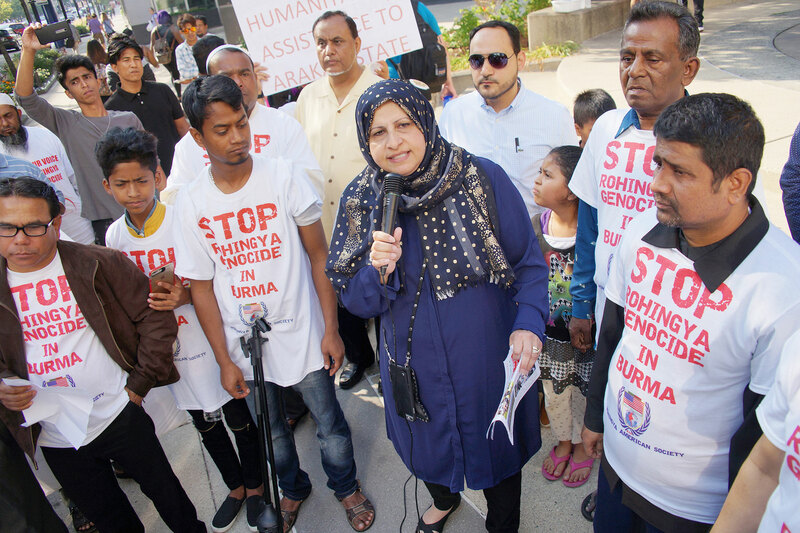 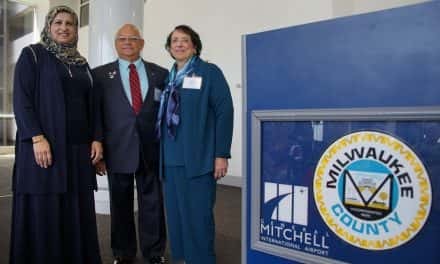 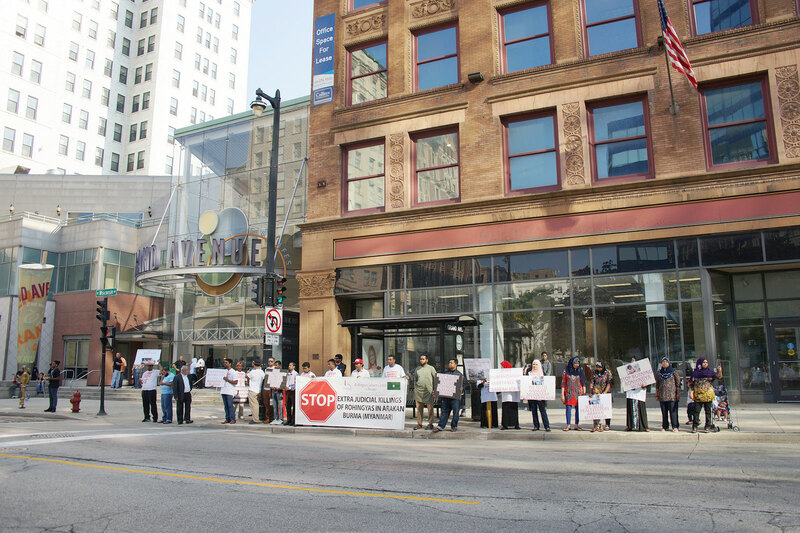 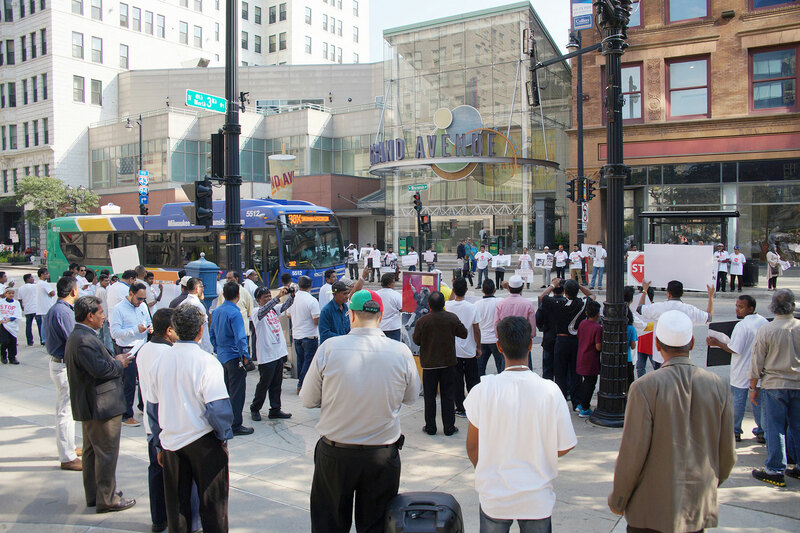 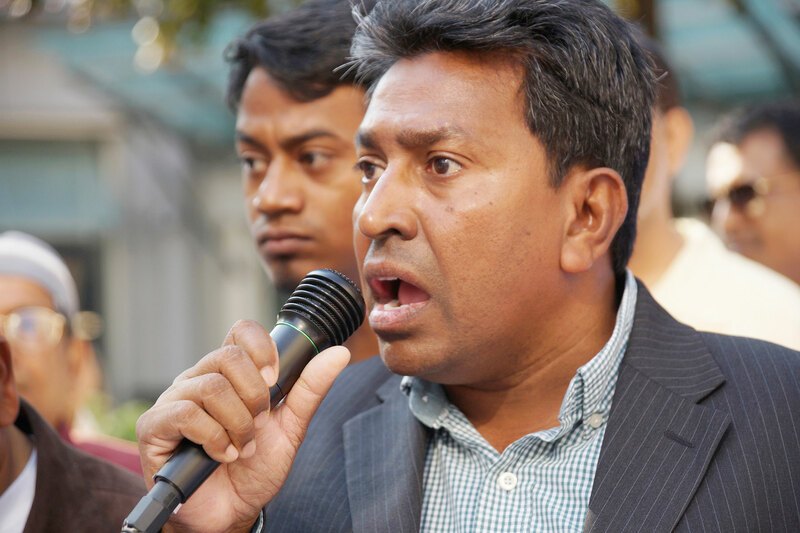 The leader of the Rohingya American Society (RAS) in Milwaukee expressed hope that one day their fellow Rohingyas in Myanmar could experience this same freedom.